Away this weekend with family and friends staying in rustic cabins on the edge of the Big Thicket National Reserve. 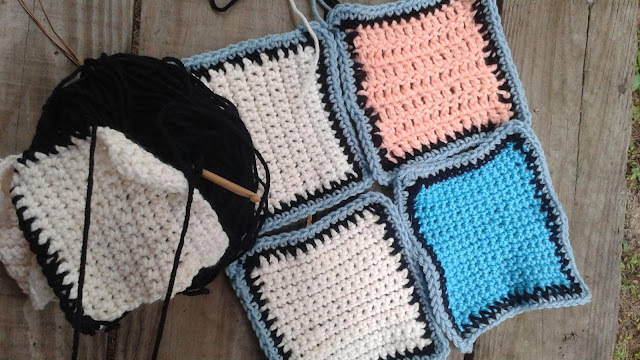 Found a little time to work on my current charity lapghan project. I am edging lapghan #8 in black and pale turquose before joining with a slip stitch in the latter. We have almost reached our goal of ten lapghans after just four Yak and Yarn meetings. Yay! Fortunately I am not the sole joiner of squares in our group so the pressure is off and I'm working at a leisurely pace. I have heard that joint square making projects often founder and stall when joining is left to one person!